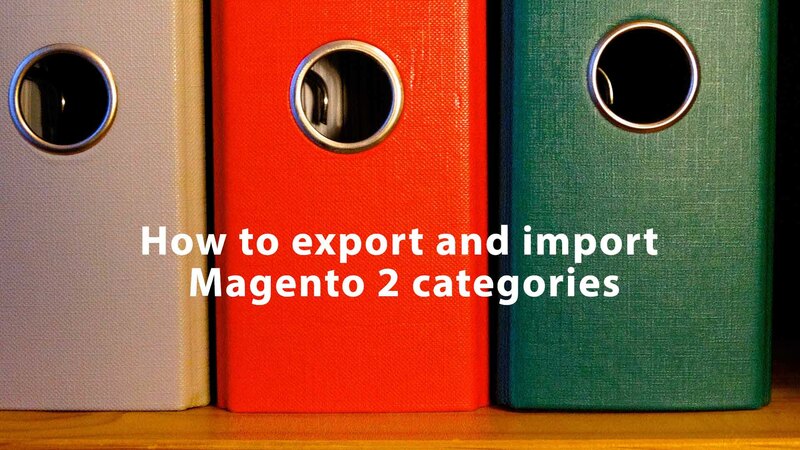 In this guide you will also learn how to import product positions in the category, a part of Visual Merchandiser functionality of Magento 2. Improved Import and Export extension allows to export and import product categories, – an invaluable tool for building product catalog fast. The categories are imported and exported like any other entity with Improved Import and Export extension, via the jobs. To get a reference to the category attributes, let’s first export existing categories to see how the table will look like. Apply necessary attribute mapping and filters. Once done setting up the export job, click ‘Save and Run’ button at the upper right corner of the screen to get a CSV table with all categories available at your store. At Google Sheet Master Table – Improved Import and Export extension we will be using for importing categories supports Google Sheets as an import source. That’s why we have composed a Google Sheet Master Table where we have gathered all import entity types with description and sample values. Sample import tables from both locations have been tested and are working properly. Feel free downloading and editing the tables to your liking, or copying the Master Table to your Google Drive. Now that we have the sample table, it is time to talk about its formatting. 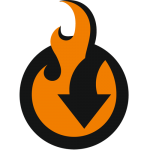 Improved Import and Export extension allow you to use two table file formats: CSV and XML. Both tables should be properly formatted before import. If for some reason you have decided to create an import table manually – make sure to use the following settings. If you want to import a table of different formatting Improved Import and Export extension allows you to map fields and value separators manually. We will talk about this later in this post. Now that we have a CSV table with the categories let’s break it down to see which attributes are used in importing categories, and which values are expected from the store owner. image The main category image and its path Should be uploaded to /pub/media/import. category1/category2/. Use / to separate categories. Multiple values should be separated by comma. Position – the products will be sorted depending on their position in the category. Product Name – the products will be sorted in alphabetical order. Products only – only products displayed. position Category position in the parent category. From top till bottom. The lower the value the higher the category’s position. However, if you have received the import table from the different source you can skip renaming the attributes. Instead you can take advantage of Improved Import and Export extension attribute mapping. With the attribute mapping you can select Magento 2 category attribute and set the reference column from the import table. In such way you will only need to select the values. The extension will communicate proper attribute names to Magento 2 during the import process. We will talk about the attribute mapping more as the post goes. To start with the extension log in to your store admin panel and navigate to System > Improved Import / Export > Import jobs. 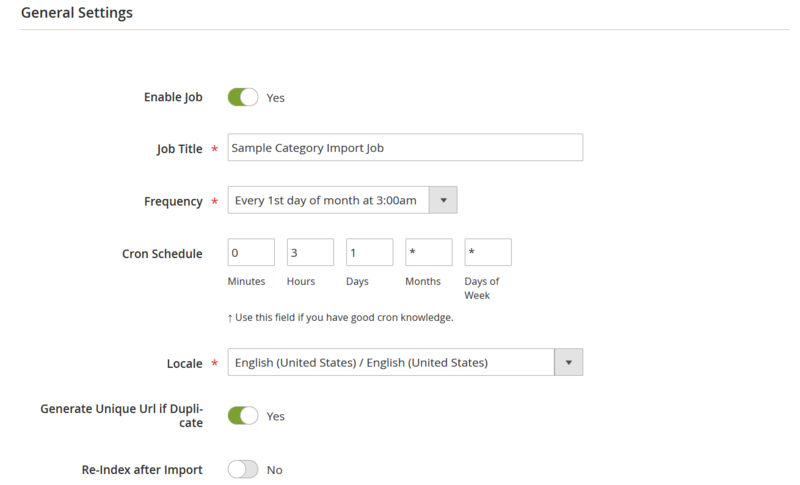 The Import Jobs is your main import management screen. 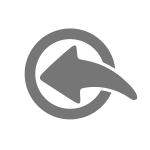 Here you will be creating and editing all the import jobs. The New Job screen will greet you with the General job settings. The settings are pretty much self-explanatory. You need to identity the job by naming it and scheduling it. Otherwise you can the job manually. Next, you will need to select the locale of the store you will be importing to. Re-Index after Import – allows re-indexing the store after the entity has been imported. After done with general settings you will need to select the entity you are going to import. In our case it is ‘Categories’. Delete – delete categories matching the ones in the import table. After selecting the behavior, you can specify the validation strategy – whether the extension should skip or stop the process if any errors. This will help you to understand if anything is wrong with your import table. NOTE: play close attention to Categories separated by and Category levels separated by settings. Categories separated by – when you are importing products, you can decide which separator you use for the categories column. By default comma is used to separate multiple category paths. However, if you have commas in category names you may want to use different separator for category paths. Category levels separated by – when you are importing products, you can decide which separator you use for the categories column to separate category levels. By default / is used to separate multiple category levels. However, if you have /s in category names you may want to use different separator for category levels. At last the extension offers you to manually map the import table formatting by setting field and value separators. Here you are suggested to select the import table file format and specify the source you will be importing from. At the screenshot below we are using direct link to the Google Sheet with our CSV table uploaded. When the source is specified click ‘Validate file’ button to let the extension to check the integrity of the import table. Once the import table has been validated you will presented with the Map Attributes section. In this section you can set the reference between category attributes used by your Magento 2 store and the ones you are using in your import table. This is particularly useful if you have got the import table from other ecommerce platform or composed it manually without considering proper category attribute naming. That’s it, now you only need to click ‘Save & Run’ button to proceed to running the import job created. Once you hit ‘Run’ button the extension will present you with the import job log, where you can check how to the import went and look for any errors. 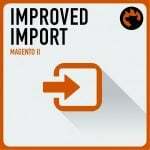 You have just imported categories to your Magento 2 store with Improved Import and Export extension. There you will find step-by-step instructions on how to import products with every product attribute explained. Now, to importing product position in categories. To import position we will be using custom product attribute categories_position, that only works for Improved Import and Export extension for Magento 2. Again, this is a custom attribute, and it will not work with native Magento 2 import procedure. You can refer to the screenshot above to see how it looks in the actual CSV table. That’s pretty much it. Using this pattern you can import product along with their position in the specified categories. To import product positions you need to select entity=Products when creating an import job. Then you configure the import job as usual, don’t forget to add categories_position attribute however into the file you will be importing.